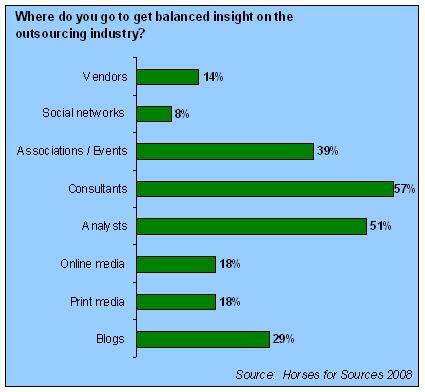 Whom do you trust for balanced outsourcing advice? For the results of this poll, please click on the continuation sheet. I would be careful to get advise from consulting companies that may be paid by large organizations to name them as industry leaders or best in breed. I am in the outsourcing business. I highly recommend that you do your own research. Bring in the organizations that you feel fit your need and have them present their story. Additionally, I suggest that you get references, that you select from the suppliers client list and ask them directly about quality, price and partnership. Make sure that when the service providers present to you that they have subject matter experts doing the presentation, not sales people. There are many organizations that can tell a great story with professional speakers, but can not deliver the services. Find organizations that can walk the talk. i feel its more about where you are coming from. in outsourcing, there are tried and tested waters, and then there are the "new" set of processes which are rarely outsourced. In the tried and tested - rankings, consultants, references help. In the Others, where a pricing model, risk-reward model or engagement model is path-breaking, you have to trust your judgement, experience and skills of the outsourcer, and this has to be "owned" by the consultant who is wanting to consult you. Very few consultants out there have any stake once the relationship goes bad. That has to change if they want to actually help organisations in path-breaking initiatives. Consultants, Analysts, Bloggers, Journalists and others always come with a perspective which would be a good datapoint while seeking an outsourcing advice. However, each of these groups come with a natural bias driven by their own goals and operations and no single group can be the answer to all outsourcing scenarios. I will always seek and capture data points from all sources but I will always depend on myself or my trusted friend for a "balanced" advice.